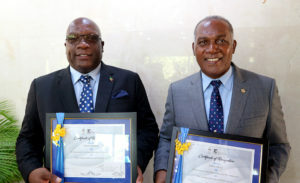 BASSETERRE, St. Kitts, October 10, 2018 (Press Unit in the Office of the Prime Minister) – Dr. the Honourable Timothy Harris and his Cabinet colleague, the Honourable Vance Amory were among some 70 past students of the University of the West Indies (UWI) who were duly recognized by the regional institution for having excelled in their respective career paths. 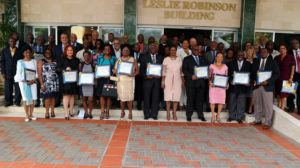 Other notable UWI alumni recognized at Wednesday’s ceremony included Professor Emeritus Sir Frank Alleyne; former Prime Minister of St. Lucia, Dr. Kenny Anthony; former Prime Minister of Barbados, the Right Honourable Owen Arthur; the Honourable Dame Janice Pereira; the Honourable Madam Justice Maureen Rajnaught-Lee; the Honourable Justice Adrian Saunders; Pro-Vice Chancellor and Principal of the University of the West Indies, Cave Hill, Professor V. Eudine Barriteau, St.Kitts-Nevis Opposition Leader Rt. Hon. Dr. Denzil Douglas as well as the Director General of the Organization of Eastern Caribbean States (OECS), Dr. Didacus Jules.